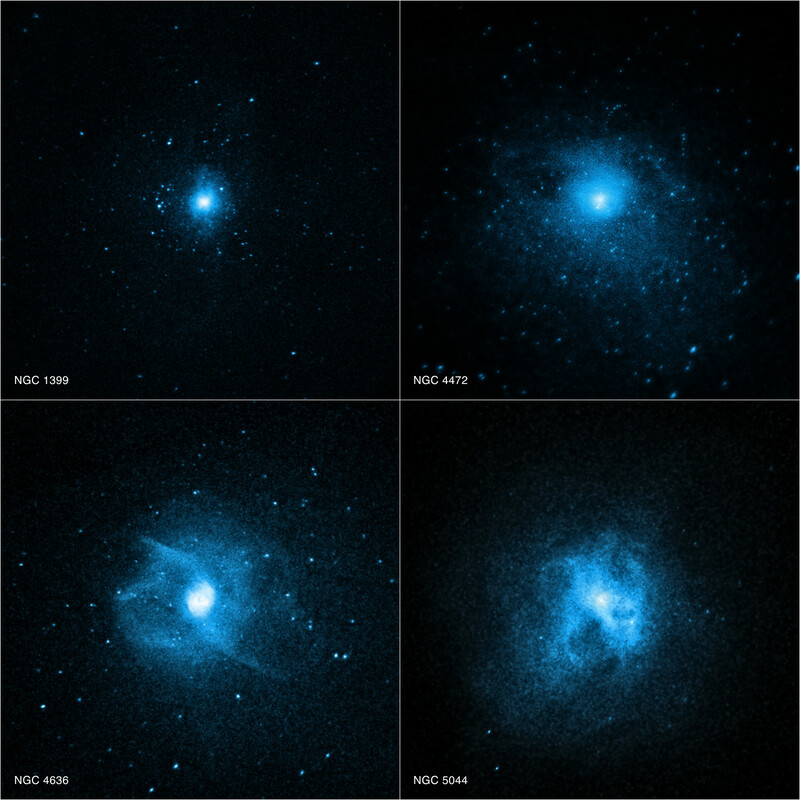 NASA just published a beautiful collage of images of four giant elliptical galaxies, taken with the Chandra X-ray Observatory, from a study I published together with Aurora and several other collaborators. Giant ellipticals are the largest galaxies in the Universe. They also appear to be very old: most of them stopped forming stars 10 billion years ago. Years back, when I was still a student, I learned that giant ellipticals don’t form stars because they ran out of cold gas – which is the fuel for star formation – long time ago. Instead of cold gas, they have extended atmospheres of diffuse, 10 million degree hot gas, that you can see in these beautiful Chandra images. Suspecting that our picture might not be complete, four years ago, I decided to search for cold gas in some of these galaxies with the European Herschel Space Observatory in far infrared wavelengths. I must admit that I was scared that after spending many hours observing with this expensive space telescope, we might see nothing, confirming the old ideas taught in school. I was therefore really happy when the data came back and I saw that there is plenty of cold gas in most of the giant ellipticals that we looked at! For the galaxies containing cold gas, the X-ray data from Chandra show evidence that the hot gas is cooling, providing a source for the cold gas observed with Herschel. This is good news, because it confirms our basic theories for galaxy formation. But if the hot gas cools, producing the fuel for star formation, why do the clouds of cold gas not form stars? The X-ray images of these galaxies, including NGC 4636 and NGC 5044 displayed on the bottom of the collage, show that their hot atmospheres are disturbed by outbursts – giant explosions – in the vicinity of the supermassive black holes in their centers. These outbursts are probably driven, in part, by the black hole swallowing some of the clumpy, cold gas. They dump most of their energy into the center of the galaxy, where the cold gas is located, preventing the cold gas from cooling sufficiently to form stars, and gradually destroying it. We also see that the central hot atmospheres of galaxies in which we find no cold gas, such as NGC 4472 and NGC 1399 on the top of the collage, look smoother, less disturbed. Their supermassive black holes swallow hot gas from the X-ray emitting atmospheres, creating even more powerful jets of highly energetic particles. By pushing against the hot gas, these jets heat it, preventing it from cooling and forming cold gas. The centers of NGC 1399 and NGC 4472 look smoother in X-rays than the other galaxies, likely because their more powerful jets extend further from the center, where the X-ray emission is fainter, leaving their bright cores undisturbed. Tagged Chandra X-ray Observatory, giant elliptical galaxies, Herschel Space Observatory, star formation. Very interesting. I never realized that such an area of space existed that it was so huge and hot, that gas can’t simply get together to form a star. And we are talking a HUGE Galaxy size area. Wow! I guess, if these are very old galaxies, then the Milky Way is luckily not so old, and perhaps quite young ones exists? What would a young galaxy look like? Mostly gas and few star? Perhaps hard to detect since it isn’t throwing out x-rays or much of anything? Pretty neato stuff.